And for most of us, some of those intentions will center on our health. They’ve put their needs on the back burner for far too long and they’re ready to take back what’s rightfully theirs. While goals like these are usually physical in nature (weight loss, exercise, dress size, what to eat), whether we achieve them or not is dictated by the six inches between our ears (our brains). In fact, what we think about our goals - for instance, whether they are realistic, inspire us, or disempower us - is crucial in determining whether we make them a reality. And, if the expectations we have about our health goals are disempowering, out of alignment with reality, or what’s possible in our particular circumstance, something happens inside of our beautiful brains. Unfortunately, it’s not pretty. But let’s start with the positive side of things first, shall we? Positive, realistic, and empowering expectations powerfully prepare your brain to anticipate an awesome event coming your way. For example, whether you’re seeing a delicious piece of cake in real life or you’re just anticipating seeing a piece of cake, in both scenarios a happy hormone in your brain called dopamine is activated. Fun fact: Dopamine is a key player in getting us off the couch and into the gym - it’s what creates the desire to meet our goals. So, we want more of this little powerhouse around whenever possible! But what the heck does that have to do with your health goals? I’m glad you asked! When you set a goal - whether it’s to get back into your pre-baby clothes or kick caffeine (gasp! ), you make a decision that the end result is one of value. And, as you think about this goal, you increase the expectation of a reward (making your brain do a happy dance, which keeps you motivated). In fact, your brain actually GRAVITATES toward events, people, and circumstances that connect you to your high-value goal. Pretty cool, huh? But here’s where we run into trouble. When we create expectations that aren’t reasonable, personally inspiring, or possible to meet within the timeframe we’ve given ourselves, we’re setting ourselves up for disappointment, regret, and possibly a date with Ben & Jerry’s to numb those hard-to-swallow emotions. Unmet expectations like the ones I’ve described above can create a threat response in our minds. And, since as human beings we’re wired to pursue pleasure and avoid pain/threats...well, you can see how this doesn’t pan out in our favor. 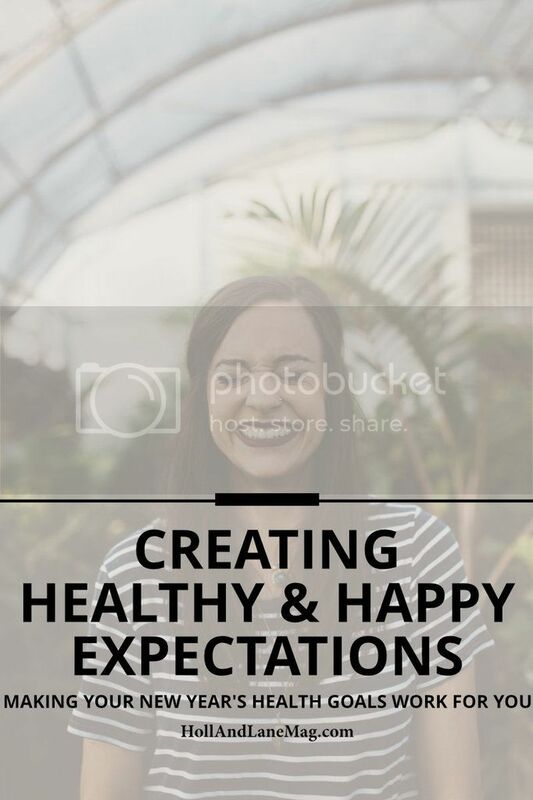 That is why it is incredibly important that the goals you make for your health this year be accompanied by expectations that are desirable, positive, and achievable. (This makes sense, though, right? Teachers know that our children excel in a subject they are excited about. The same is true for our health goals and expectations). If you write down your health goals and expectations this year and they don’t excite you or make you happy, then take a moment to draft another set of goals that do. The key to a healthy lifestyle is making choices that are both doable, pleasurable, and sustainable. To help you get started on this expectation exercise, here are some quick and easy tips for how to make 2017 your best (and healthiest!) year ever. Practice noticing what your expectations are in any situation. Are they serving you or setting you up for disappointment? Are they rooted in fear or empowerment? Experiment with setting your expectations a little lower than you normally would. You will be pleasantly surprised when you exceed them, which will keep you motivated and inspired. To stay optimistic with your goals, find creative ways to come out ahead of them every time. Expect good things. Doing so will activate that happy hormone dopamine, keeping you happy and moving toward the goals you’ve set for yourself. This year, I invite you to make your goals and expectations work FOR YOU! Shelly Robinson is a certified Health & Performance Coach who helps busy moms look and feel good while chasing their dreams. She believes that moms CAN thrive in all areas of their life that they care deeply about one baby step at a time. When she’s not coaching, she’s snuggling her two kiddos, playing volleyball with her husband, or sipping iced matcha lattes.